Until quite recently, Sony’s solid-state camcorder line progressed fairly logically. 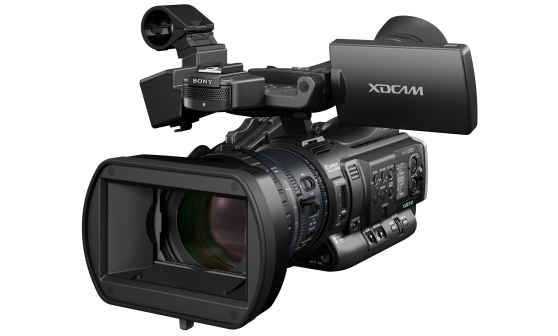 At the high end, the XDCAM EX system started with the EX1, with three ½ inch sensors, and moved up, with the EX3 adding interchangeable lenses, timecode, genlock and a semi-shouldermount design, the PMW-320 offering a full shouldermount form factor, and the PMW-350 stepping up to a 2/3 inch sensor. All the cameras recorded at a maximum of 35mbps, in 4:2:0, on Sony’s prioprietary cards. Above that, the company offered the high-end PMW-500, with 50mbps, and 4:2:2. At the lower end, the NX5 tweaked the consumer AVCHD format, but offered three 1/3 inch sensors. Then there were the more specialist cameras, such as the weather-resistant NX70, and the large-sensor FS-100. 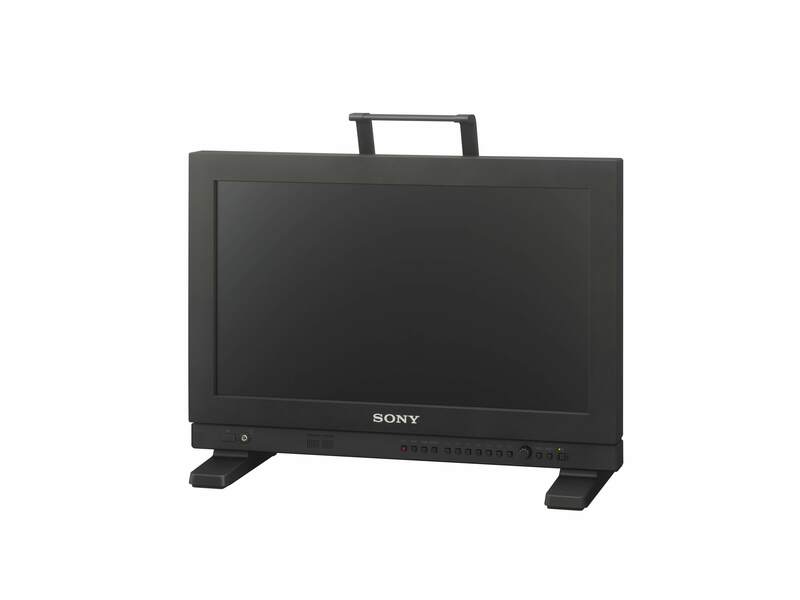 Then, at NAB, the company announced the PMW-100, and changed everything around. The PMW-100 is an entry-level XDCAM EX camcorder. At around £2,500 before VAT, it costs less than the NX5. But it records at up to 50mbps, 4:2:2. This gives it a codec on par with the vastly more expensive PMW-500, at least on paper. The whole question of bitrates, and where this leaves Sony’s solid-state camcorder range will be covered in a separate article. And, although there is talk talk that the PMW-100 will not gain the much-coveted BBC HD stamp of approval, it does seem that Sony is preparing for a wider market shift to 50mbps. Canon already offers this on its XF100/105 and XF300/305 cameras, so Sony are really playing catch up. As HD Warrior noted above, and Nofilmschool has also reported, the PMW-100’s small (single, 1/2.9inch) sensor might be the issue. This matters, if you work in broadcasting, and want or need to supply footage to the BBC. But if you don’t, or have another camera for that work, then it would be wrong to rule out the PMW-100 without a closer look. The PMW-100 is small. It is not quite as small as Canon’s XF105, probably its nearest competitor, and it is larger, by a margin, than a semi-pro camera such as Canon’s XA10 or Sony’s older A1E. Both of those cameras work with their XLR mountings removed, handy if you don’t want to look “pro”. It is also a very light camera, but it does feel a little plasticky in parts. The build is closer to perhaps the FS-100 than the venerable Z1, which to be honest is a bit of a tank. But the layout is logical enough: XLRs to the front and right, a fold-out LCD screen, viewfinder to the rear, and the main controls and card slots on the left. The camera users Sony’s SxS cards and adapters for SD cards, but currently only the Sony cards support 50mbps. The camera will also use QXD cards, again via an adapter. Set against this, the PMW-100 has plenty of connectivity: HD-SDI, HDMI, Firewire, timecode (switchable between in and out), genlock and analogue. 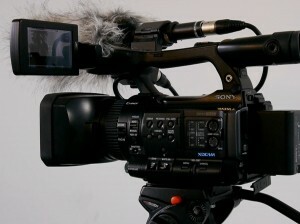 The built-in microphones are the standard stereo, camcorder type. But no external mic comes included in the package. Conveniently for owners of other XDCAM EX cameras, the PMW-100 uses the same BP-U batteries as the EX1 and EX3.The camera has two card slots. The Exmor lens has reasonable coverage: 5.4 to 54 mm (40-400mm in 35mm terms). But disappointingly, there no neutral density filter at all, and given the arrangement of the lens and hood (and the 37mm thread), adding a variable ND might be tricky. The layout of the camera’s controls are logical enough, and will be familiar to anyone who has used a Sony digital camcorder from the PD-150 onwards. The main controls are grouped on the left, with a handgrip on the right, and the main connections to the rear. Camera controls include separate dials for left and right audio, and auto-manual switches (Line/Mic +48v switches are by the XLRs themselves). Peaking and zebras are set using small buttons on the left, are full-auto mode, and white balance. There is a Push AF button but also an expanded focus button by the viewfinder. Gain and white balance presets are on small switches, similar to those on the Z1. Video playback buttons are grouped under the flip-up LCD screen. The main area where the pro feel breaks down, though, is in the lens controls. There is a shutter control button, but no aperture control on the lens; instead there is a small aperture control wheel to the left of the lens. This is almost identical to those on Sony’s higher-end consumer camcorders. Certainly, this is not the most ergonomic of designs. In our tests, the aperture appeared to step, rather than operating smoothly as a broadcast lens would; it is of course controlled by a servo. The screen failed to display aperture information, another minor nuisance. The main compromise, though, is the lens control. There is one ring on the lens, which can be switched between zoom and focus. Manual focus worked well enough, but the focus throw was quite long (it may be that this can be adjusted). There are two rocker switches for zoom control on the camera, and both work quite well. But the manual zoom ring, again a servo, moved very slowly on our test camera. This type of arrangement was used by JVC on its GY-HM100, but they have improved on it since, and although usable, it is nowhere near as precise, or as flexible, as the lens arrangement on the EX1 or EX3. Battery life, during our tests, was excellent. The real test of any camcorder is, of course, its picture quality. Here, the PMW-100 fares well, given the restrictions placed on it by its 1/2.9inch sensor. Outdoor shots were generally well-exposed, and held detail well, including in shadow areas and those with high contrast. Sound quality was also good (the camera actually supports four-channel sound). Our first tests with the camera did show a distinct colour cast or bias towards the blue, but setting the camera to manual, re-exposing, and re-engaging auto seemed to do the trick. The “blue” footage also corrected easily enough in Final Cut. The camera handed highlights well, with not too much of burning out in the whites, although a neutral density filter would have been useful to control this, and give better control over the aperture. However, with an aperture of f1.8-f2.9, rendering backgrounds out of focus will always be tricky. Overall, even at 35mbps and 4:2:0, the footage held up well to colour correction and grading. In low light, the PMW-100 is not a bad performer, but the images lack the clarity and sharpness of the daylight footage. In some cases, the autofocus failed to snap on to the subject as precisely as in daylight, and the manual focus system is not as precise as a lens-based one such as the EX3’s. There was a graininess to the low-light clips (and our tests were not done in extreme low light) at the lowest gain settings; increasing the gain setting did not seem to reduce image quality, so it may be possible to shoot at higher gain levels with no ill effects. Unfortunately, during these tests, it was not possible to try out the image stabilisation, slow-motion features, or live outputs. 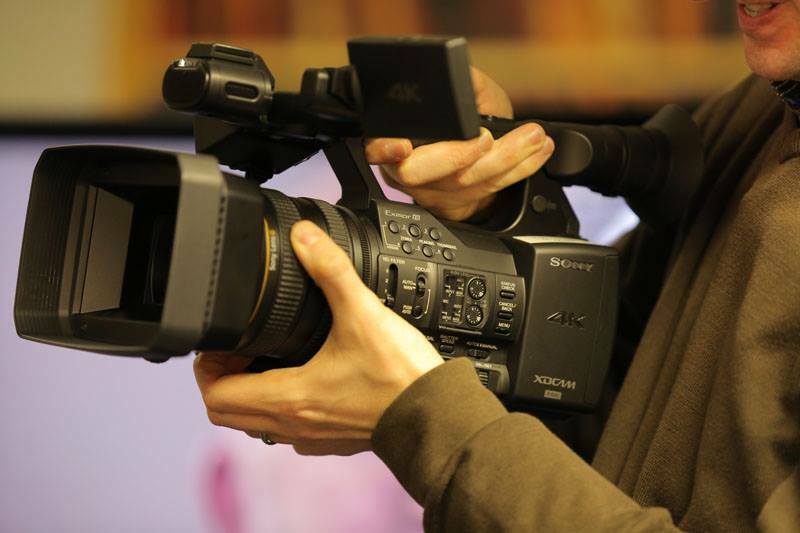 With the PMW-100, Sony is taking the fight to Canon, and its 50mbps-equipped camcorders. 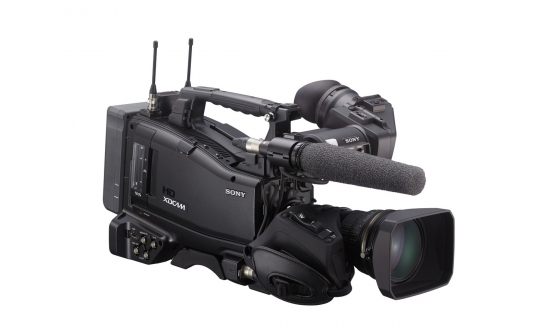 The PMW-100 may well signal that Sony is planning to update most, perhaps all, of its XDCAM EX cameras to 50mbps 4:2:2. But it is interesting to see the company start at the low end, with a camera that competes with, or even undercuts, DSLRs on price. And the PMW-100 also has several features to differentiate itself from the Canon 5D and 7D and Nikon D800 competition: proper XLRs, timecode, genlock, a reversible viewfinder, and a full range of outputs. This makes the PMW-100 well suited for live streaming, events, and long-form production, areas where DSLRs struggle. The downsides, as to be expected, were in low-light performance, and in controls and ergonomics. The low light is disappointing, especially to anyone who has become used to working on DSLRs or Sony’s ½ inch sensor camcorders, as well as units such as the FS-100. But used with care, or with appropriate lighting, the camera is certainly good enough. The ergonomics are a little trickier to work round: this is not a smaller EX1, and it competes with the Canon XF105, not the CXF300/305. For a producer or video journalist, the camera is perfectly usable, but a full-time cameraman or woman may find it frustrating. The camera’s full auto mode was good, but not infallible. Again this is to be expected. With a few settings tweaks, the camera will perform well, the price is attractive, and its portability is a big plus for journalists on the go. We have uploaded a short video review of the PMW-100 camcorder, and have also added a low-light test. Hopefully we will put up a short piece made using the PMW-100, soon too.Thanks to Chris Mack at Starlight Productions for the loan of the camera.